Today is the 50th anniversary of Dr Martin Luther King’s famous and brilliant ‘I have a dream’ speech. Dr King delivered this address at the Lincoln Memorial as part of the ‘March on Washington’. The speech has been endlessly analyzed and discussed and it is rightly regarded as one the best examples of public oratory of the 20th century – it could well be the best example. Although I wasn’t born until the year of King’s assassination, I have a vivid memory of hearing this speech for the first time when I was about eleven years old: a teacher played it to us at a school assembly on a battered reel-to-reel tape machine and I was blown away by it. As Sam Leith reminds us in his recent book on oratory, Dr King’s speech is best understood as a ‘sermon’ in the tradition of black Southern Baptist preaching . I hadn’t really appreciated until today the extent to which the speech is filled with allusions to, or citations of, other texts, songs and speeches. We get the Bible and other scripture of course, but we also get, inter alia, the American constitution, a traditional ‘Spiritual’, Lincoln’s Gettysburg address, the US National Anthem and Shakespeare’s Richard III. King also re-uses phrases and ideas which he and other activists had been honing in their orations and church sermons for over a decade. I also hadn’t realized that King had pre-prepared the speech but started to depart from his text and improvise. The ‘I have a dream’ section is the most improvised bit. Leith mentions an academic journal article on ‘I have a dream’ by Alexandra Alvarez (Journal of Black Studies, Vol. 18, No. 3 (Mar., 1988), pp. 337-357). I’ve just read this article with great interest and admiration. What Alvarez does is show how the speech can only be fully understood as a ‘speech event’ in which King is engaged in an antiphonal dialogue – ‘call and response’ – with his audience. This format is typical of oral-traditional black Baptist sermonizing. By transposing that dialogue form to a context of mass political protest in the heart of Washington, King and the crowd become ‘senders’ of the speech’s demand for equal rights. The primary ‘addressee’ of this joint call is the US Congress. 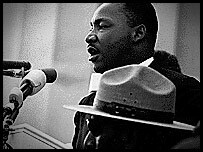 Alvarez shows that King’s several repeated phrases (e,g.’Now is the time’ and ‘I have a dream’) are actually formulae which both encourage the audience to vocalize their affirmation and encapsulate the speech’s essential message when strung together. Given that repetition of words or phrases are a well-known Greek and Roman rhetorical device and category of analysis (‘anaphora’) , one is tempted to see whether this dual function can be ascribed to ancient examples as well. Alvarez rejects any transcription or analysis of the speech in terms of sentences and paragraphs as a distortion of its performative, dialogic and poetic dynamics. Here are a couple of excerpts of her transcription. You need to know that the numbered ‘lines’ correspond to units of utterance which are followed by pauses and whose ends are marked by rises or drops in intonation. Alvarez believes that falls in intonation are a particular signal to the crowd to respond if they wish. The words in brackets are the responses of members of the crowd which are audible on tape (you’ll see that some follow a rise in intonation). ‘A’ denotes a response in the form of applause; ** = falling intonation; *** = rising intonation. I have come across even more complex systems of notation on the part of sociolinguists and anthropologists in their attempt to reproduce and analyze various forms of oratory and verbal art in many different cultures (and the interaction of their audiences) which have been captured on tape. These serve to remind us that a transcript which merely records the words which have been uttered may well fail to convey the essential dynamics of the live occasion. And it is rather sobering to turn to written speeches by Demosthenes or Cicero and realize that we can only guess at the nature of their live delivery and reception. Not that we don’t get lots of clues about ideal and problematic forms of delivery in treatises and handbooks. And Greek and Roman orators have always been analyzed in terms of the ‘rhythm’ of their prose. Beneath the most obvious grammatical structures (sentences, subordinate clauses etc.) a Classicist with the right skills can point to likely pauses and cadences. But without a time machine we are never going to be able to access an ancient speech in the way that Alvarez can for MLK’s masterpiece. This entry was posted in General on 28 August, 2013 by Jon Hesk. I have just listened to an excellent radio programme about rhetoric, hosted by Stephen Fry. It is the first in a new series of his ‘Fry’s English Delight’ Show and it deals with similar subject matter to this blog . It is available online for 7 days here. Among others, there were valuable contributions from Professor Jennifer Richards – an expert in Early Modern rhetoric at the University of Newcastle but clearly well-versed in the Greek and Roman material too – and the journalist and writer Sam Leith. Leith clearly enjoys spotting classically-derived figures and tropes in the speeches of modern politicians and has a book out called You Talkin’ To Me? Rhetoric from Aristotle to Obama. Having only just heard of this, I can’t comment on it yet. I’ll perhaps do a little review of it on this blog asap. In the show, Fry argues that in place of dominant pejorative connotations of ‘spin’ and deception, we should try to restore ‘rhetoric’s’ original ‘noble meaning’. In the service of this argument, Fry played back a powerful speech by Gabrielle Gifford, the former US congresswoman who miraculously survived a close-range gunshot wound to the head. She was shot by a disturbed individual while meeting with her constituents outside a supermarket. The brief but emotional speech was made at a Senate gun control hearing. Gifford’s head injury was so severe any attempt to speak is still very difficult for her. Jennifer Richards showed how, despite Gifford’s understandably slow and faltering delivery, the speech’s power and persuasiveness derived in great part from its utilization of rhetorical devices that we find being used and analyzed by the ancient Greeks and Romans. We do not notice them in so simple and heartfelt a speech as this – but they ARE there. Gifford’s use of rhetoric to make the case against gun culture – when her own career as a democratic representative was destroyed by a gun and several of her colleagues and constituents were killed or injured by the same gunman – served as a powerful illustration of Sam Leith’s point that rhetoric is the only means we have to debate policy, or argue and settle disputes without recourse to violence. Richards’ appeal to Kenneth Burke’s definition of rhetoric as ‘equipment for living’ also seemed relevant to Gifford’s case. One wouldn’t want to argue against the view that rhetoric is a good thing when it serves the ends of non-violent debate, dispute settlement and democratic representation. But the show didn’t get far into the question of competence and training in the evaluation of arguments amongst those who do not have the power or opportunity to be anything other than members of the ‘the audience’ for other people’s rhetoric. We heard about Cambridge students learning debating skills from each other at the Cambridge Union and a consultant who teaches his business clients about the art of persuasion. But for rhetoric to be truly ‘democratic’, we need EVERYONE to be good at spotting a ‘false enthymeme’ or to tell when ‘ethos’ and ‘pathos’ are masking a weak argument. Otherwise, we risk inhabiting a political culture where what the fifth-century ‘sophist’ Gorgias called the ‘great dynast’ of persuasive speech serves the interests of the trained few and not the majority. Rhetoric needs to be ‘equipment for living’ in the sense of ‘analytical tools for the critical evaluation of potentially manipulative speech’ as well as in the sense of ‘tools for persuading people’. This entry was posted in General on 26 August, 2013 by Jon Hesk. Under the ‘Thirty-Year Rule’, the UK government has just released the text of a speech written for Queen by Whitehall officials which was never delivered. It was drawn up as part of an exercise in which officials ‘war-gamed’ the country’s response to a chemical attack by the Soviet Union and their allies. The 1983 speech assumes that a nuclear exchange between NATO and Eastern Bloc countries is imminent. It would be easy for me to claim some parallels to the content of ancient Greek or Roman speeches made on the eve of battle here or to mine it for classical rhetorical devices. But the differences outweigh the similarities. There is something distinctive about the way in which these speech-writers have imagined what a figure-head would say in the face such a destructive, impactful and all-encompassing form of warfare. This is just not very Periclean, Demosthenic or Ciceronian stuff. Perhaps classical rhetoric could not deliver plausibility or comfort in the face of the uniquely modern social and political failure which nuclear war represents. How can you stir your people in terms of the defence of values when such values have clearly failed to deliver protection from ‘the deadly power of abused technology’? The speech seems to quietly acknowledge this rhetorical problem. Like some ancient speeches I can think of on different subjects which also refer to the inadequacy of words to encompass and fit the occasion, it is very revealing and effective as a result. To that extent at least, it has an ancient rhetorical feel to it. This entry was posted in General on 2 August, 2013 by Jon Hesk. A few months back it was interesting to hear constant references to North Korea’s ‘rhetoric’ in the news media. For example, White House senior adviser Dan Pfeiffer urged North Korea to end its “bellicose rhetoric” and “provocative actions.” The Guardian reported on the contrast between a ‘shrill rhetoric’ which seemed to presage war and the calm atmosphere in North Korea’s capital. These uses of the term ‘rhetoric’ convey the suspicion that North Korea’s public statements are idle threats which are probably really aimed at internal propaganda and power-consolidation by its young leader. North Korea is talking tough but will it actually do anything? In other contexts, the worry seems to be that the ‘rhetoric’ is indeed matched by ‘actions’ (the re-positioning of missile launchers etc.) but that it represents a deluded and distorted view of the world. ‘Rhetoric’ is also wheeled out as a designation when journalists or diplomats feel that certain public statements are especially manipulative, grandiose or deceptive. I’ve heard BBC reporters use the term to designate policy statements from the UK Coalition government which they suspect are eliding real differences of opinion within the administration. If he were alive today, Plato would probably pleased to hear the term ‘rhetoric’ being used so negatively. In his dialogue, the Gorgias we have the earliest attested use of the Greek word rhetorike when Socrates refers to ‘the so-called “art” (techne) of rhetoric’. Socrates argues that sophists like Gorgias are wrong to claim that rhetoric is a discipline grounded in genuine knowledge and understanding. Instead, it is a form of ‘flattery’ aimed at the gratification and deception of its audience. Where Gorgias points out that it is the rhetorician, and not the doctor, who is most able to persuade a reluctant patient to take medicine that is unpleasant but necessary for his recovery. Socrates dwells on the fact that ‘rhetoric’ does not possess or impart knowledge of any particular subject area. The rhetorician does not know about diseases and what cures them. Nor does he know what is justice, the best way to run a city, how best to fight wars or how to successfully manage public finances. As a consequence, Athens suffers from being advised by sophist-trained politicians who are good at persuading the people and telling them what they want to hear – even though the laws and policies they are arguing for are not be the best ones for the city and even though those politicians (and much of their audience) are not competent in relevant areas of expertise. Some scholars bemoan the extent to which the word ‘rhetoric’ seems to retain these negative Platonic associations, even in modern parlance. When defined as the means and modes by which we attempt to persuade each other, communicate grievances, make a case or enter into debate, ‘rhetoric’ becomes a much more positive notion. ‘How to argue well’ is a subject that can be taught and it necessarily involves the critical evaluation of arguments we receive. This (largely Aristotelian) definition can be developed so that ‘rhetoric’ is re-presented as a vital discourse of democracy, peaceful dispute settlement, equality under the law and citizen empowerment in the face of special interests. For me, though, the Platonic and Aristotelian views are two sides of the same coin. ‘Rhetoric’ and its dynamics can only be understood, properly monitored and used when we see that both views are always in play and in tension with each other – and these views are themselves often a vital part of a larger rhetoric. But the ‘rhetoric’ that lies behind definitions of ‘rhetoric’ will have to wait for another post. Brexit: does the answer lie with a modern version of ancient democracy? How some Athenian-style democracy might save our future.